Top tips for maximising how long your laptop battery lasts. Battery life is one of the most important considerations for many of us when buying a laptop. No one wants to own a device that runs out of juice within a few hours of web browsing or TV streaming. So how do you purchase a laptop that won’t prove lacking for battery power? In addition to reading our expert reviews, there are a number of misconceptions about how long laptop batteries should last and how you should look after them that have been circulating for many years. Here we tackle five of the most common below. Laptops come with headline battery life claims from the manufacturer which sometimes sound a bit too good to be true, and, according to our testing, they definitely are. Our experts often find battery life claims that are hours longer than the real story when we put them to the test in our lab. One recent laptop claimed up to eight hours of battery life, but we got less than five browsing the web over a wi-fi connection. Claims are normally benchmarked results given under specific circumstances – take them with a pinch of salt. In short, you just don’t need to do this – laptop batteries will stop charging when they are full. The battery technology used is much cleverer than it’s ever been before. Compared to 10 years ago say, you can now trust that you can leave your laptop plugged in and it will take care of itself. Again, this is just not true. Like the above, this myth still exists from older battery technologies which are no longer commonly used. If you’re using your laptop at home you should leave the laptop plugged in making sure it’s running at full speed with the laptop battery setting on ‘high performance’ (see ‘Check your power setting’ in the tips below). Your laptop’s running time on a single charge will naturally get shorter over time. After a few years you might want to replace the battery, but it’s not always as easy as all that. On a standard laptop it’s generally possible to replace the battery – costing between around £50 and £100 depending on your model – and they’re easy to fit at home. Ultrabooks however, tend to come with built-in batteries which you won’t be able to replace yourself and normally require you to send your laptop back to the manufacturer to be fitted – whether or not you’ll be charged may depend on if you’re within your warranty. Not exactly a myth, but these claims are worth looking out for as they refer to how long the laptop battery will last under very specific circumstances – some might say rather unlikely ones. You might see battery life claims of weeks, or even up to a month on some laptops, most likely on ultrabooks. Some laptops claim up to 50 days of ‘standby time’ with open files and other data kept safe in the memory. Though you can expect a longer battery life in sleep mode, the exact times claimed should be viewed with caution in terms of how they’ll stand up in a real life situation. Check your power setting – Your laptop should automatically switch to a power saving option when you’re running on battery but it’s worth checking. In Windows 7 or 8 check you’re not on a ‘High performance’ option in the Power Options settings. If you’re using the battery ‘Balanced’ or ‘Power Saver’ are more suitable, though the latter may affect overall performance. 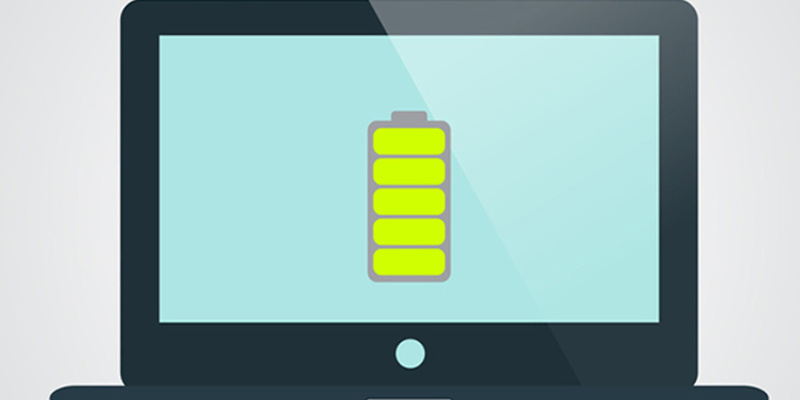 Lower the screen brightness – This will reduce the rate of your battery’s power consumption. Brightness buttons will be marked with a sun icon. Switch off wi-fi and bluetooth – Turning these connections off when you’re not using it can improve battery life. Eject CDs and DVDs – The spinning disks can eat up battery power so avoid using them when away from a power point where possible.